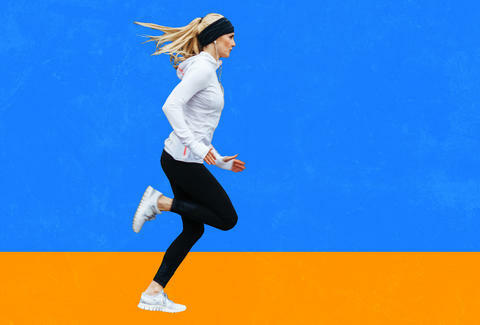 Health and fitness experts have long touted the mental benefits of exercise, but there's been surprisingly little information on what kind of exercise is best for your brain, or if they're all about the same. Until now. A recent study has shed new light on the brain's response to physical exertion, and it doesn't look as great for burpee lovers as it does for (equally crazy) ultrarunners. Yep, good old-fashioned cardio seems to work the most magic on your brain -- running, biking, swimming, and so on for an extended period of time. Not HIIT, resistance bands, or Shake Weights. According to the study, sustained aerobic exercise, like running, might have more benefits for your brain than anaerobic exercise, like quick spurts of mountain climbers during a high-intensity interval training (HIIT) workout or a strength-training session with your barbells. Researchers conducting the study found that sustained aerobic exercise had positive effects on brain structure and function, including on a process called adult hippocampal neurogenesis (AHN), which basically means nerve growth in the hippocampus. If you're forgetting your biology, the hippocampus plays a role in memory and spatial navigation, so you want to take care of it. The same study concluded that anaerobic exercise, like HIIT and weightlifting, didn't necessarily have the same AHN-boosting effects. How reliable is this study? As with most studies, you should take the results with a grain of salt, since they were obtained from rats. On the other hand, rats have ruled the New York City subway system for decades, so they must be doing something right. For anyone who's ever experienced the legendary "runner's high," though, it makes sense that aerobic work would be good for the brain. Jordan Metzl, a nationally recognized sports medicine physician, best-selling author, and fitness instructor, agrees. After all, "The mammalian brain is the mammalian brain," he says, which means you're more like the rats of NIMH than you'd like to admit. Though the study presented new findings, Richard Robinson, a personal trainer at New York City's Box + Flow, doesn't believe its results have necessarily taught us anything groundbreakingly new with respect to the relationship between exercise, physical health, and overall brain help. "However, [the study] has offered us a stronger connection for which type of exercise may offer the greatest amount of benefit for your brain," Robinson says. Does this mean you should only be running? What should you be doing if you want to be the next Jeopardy contestant, or just outsmart your opponents when the actual apocalypse happens? Metzl recommends combining aerobic and anaerobic training to reap the benefits of both methods. And whatever exercise you choose, he recommends doing it with intensity. "The main point here is that the drug of exercise, and particularly the drug of intensity, is probably the most effective brain medicine that we have," Metzl says. "More effective than any drug, any crossword puzzle, or any special food." If you aren't super-fond of hitting the road to log your miles, Metzl recommends just getting your heart rate up, whatever way you like. "Run, speed walk, yoga, swimming, jump squats, biking -- the choice is yours." Just keep in mind that "sustained' means you have to do it for more than a few minutes before your hippocampus becomes the envy of the block. Erin Kelly is a writer, runner, and triathlete living in New York City. She's skeptical of this study because she's run 10 marathons but still isn't any good at math. You can follow her @erinkellysays.